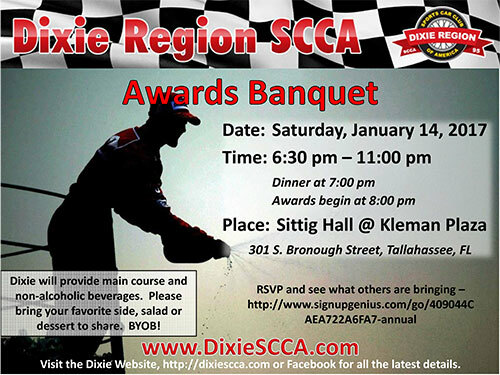 It's time again for the Annual Dixie Region Awards Banquet. Dinner and awards for the last year's Dixie Region Solo Championship Series class winners, member of the year, driver of the year, worker of the year, cone king, and of course special gag awards, too. So mark your calendars for Saturday, January 14, 2017 from 6:30-11 pm at Sittig Hall in Kleman Plaza. Dixie will provide the main dish meat and non-alcoholic beverages. BYOB. Please RSVP and plan to bring your favorite side dish, salad, or dessert to share. And don't forget to "Wipe Up The Competition” at Allies vs. Axis! Please help us by donating the most requested and needed item for the Tallahassee-Leon Shelter in serving the homeless. The number one donation needed by The Shelter is of all things, toilet paper. They use 48 rolls of toilet paper a day, over 1400 per month. The Dixie Region SCCA goal is to donate a month’s supply of toilet paper to The Shelter. Please bring a package of toilet paper on the day of the Axis vs. Allies event. If you can’t bring toilet paper, we will accept donations of $10 and we will purchase the toilet paper for you. If every entrant donates a 24-roll package of toilet paper, we will exceed our month supply donation goal. Please be a part of the Dixie Region supporting The Shelter. Make your vote count! 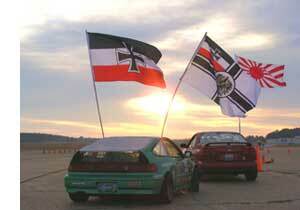 We will have awards for the Crappiest Run & The Best Decorated cars for the Allies & the Axis so vote and vote often. Look for the ballot boxes around the timing trailer the day of the race.